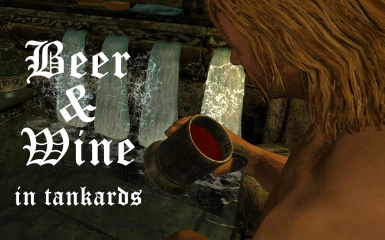 Adds wine - or beer - in tankard drinking animations' animobjects and tankard clutter objects. Stop pretending to drink from empty mugs - pick and install your favorite booze! Have you watched these poor bastards stare at the bottom of their parched tankards in silent melancholy?.. Have you ever tried to get a drink yourself and found yourself stupidly staring into nothingness? 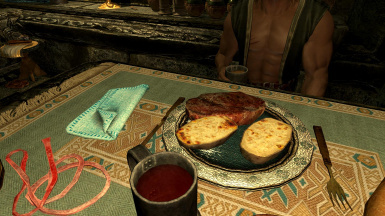 Is this another unacceptable Thalmor Prohibition? Or is it just the ultimate affront to role-playing?!.. Put an end to that curse right now! 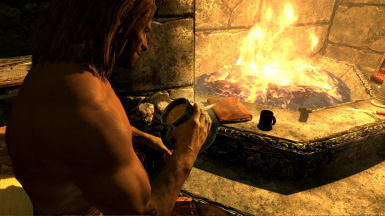 Let wine and beer flow freely in each and every tankard in Skyrim, let the taverns' audience finally raise their glasses in joy and face the mountains weather with fire in their veins! Ahem... this is only a small replacer for the game's tankard animobjects and clutter. It comes in two different versions. Wine. Or Beer. 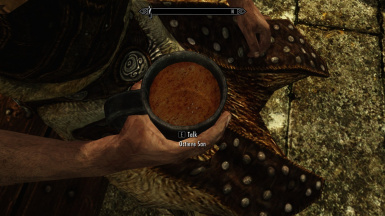 PLEASE NOTE: The tankard's meshes and textures I used are Brumbek's from his Skyrim Meshes Improvement Mod (with his permission of course). Please endose his awesome work!.. Many thanks to Brodual and Nozi for making these videos. You're great, guys :)! Use your Mod Manager - or do it manually if you'd rather mix with another clutter version. No .esp to enable of course. I strongly recommend that you install only one version (Beer or Wine) of the animobjects. 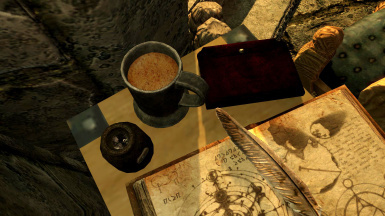 There are actually 3 tankard animobjects in the Vanilla BSA. 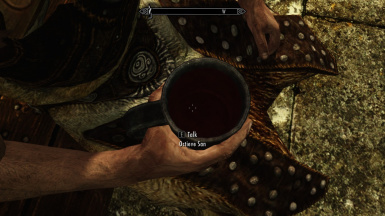 I have seen my animations change with only the animobjectDrinkingTankard in game while Fore only saw the animobjectTankard beig used in the Behavior files. Since we can't be entirely sure the game does not actually need all 3 of them at some point, I modified them all. As for the clutter version, it doesn't matter which one you pick as replacer. You can use Beer for animation and Wine for clutter or the other way around - it won't break anything. The clutter version is the basictankard01.nif in your 'meshes\clutter\dining set' folder. If you want to mix, install one main file with NMM for the animobjects, then unzip the other version, replace manually the basictankard01 in your data files and do not forget to add the corresponding textures folder. EDIT October 25th: for those of you who do not want to replace the clutter version of the tankard and prefer to keep empty tankards in shelves or scattered on the ground, I have just added 2 'animobjects only' versions. This will only modify the animated drinking and nothing else. If you have already installed a complete version, uninstall the old one first and then install this new one. Do not overwrite, as it will not remove the clutter version. - and the "Hoamaii Wine" and/or "Hoamaii Beer" folder(s) from the textures directory. This will obviously conflict with - and replace - any other tankard retexture you may have installed. 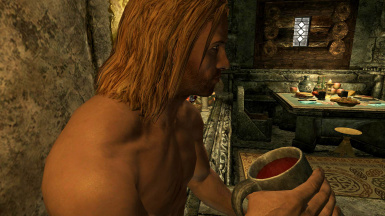 As for adding drinks in tankards, I don't think anybody else has done it yet. None that I'm aware of. 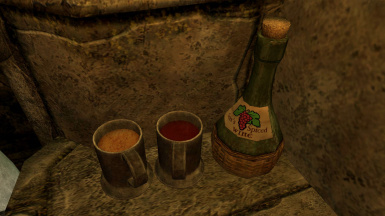 The Wine and Beer transparency may appear lighter or darker in your game depending on your settings, your lighting mod or your ENB. But that's all I can think of. - Fore, for kindly sharing his animation expertise. - Nightasy, as always, for teaching me all I know (and more) about modelling and texturing. 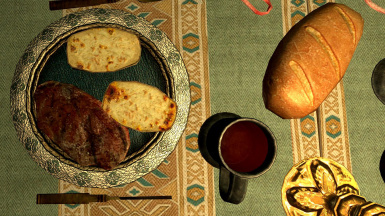 - Bethesda, for Skyrim and the CK. - and all the Nexus people for making this such a great gaming community.